“Philippine President Rodrigo Duterte is undoubtedly one of the most sincere world leaders of the contemporary era” – Geo-political expert Adam Garrie said on his latest article. Garrie said that Duterte was not only a humble president but also a deeply realistic leader who was able to execute both domestic and foreign policy. “Duterte has resisted the temptations of grandiosity that often accompanying being a head of state and has instead stayed true to his humble roots as a son and former mayor of Davao City. But just because Duterte speaks from the heart while using colourful language, does not mean that he is not a deeply pragmatic leader who is able to eschew ideology in order to accomplish the ordered execution of both foreign and domestic policy.” Garrie said. “However, if such discussions are not forthcoming or if they do not lead to tangible results, everything from total war against insurgents and martial law aimed at containing terrorists to a wholesale remodelling of the political system of the country will remain firmly on the table.” Garrie explained. According to Garrie, the Catholic Church in the Philippines though not a foreign state, bears danger as it could meddle with secular political affairs of the country. “While the Catholic Church in The Philippines is not a foreign state, the Church’s meddling and neo-colonial relationship with the secular political affairs of The Philippines are just as serious as anything a foreign power could do to a country short of an all out military conflict. Because of the Catholic Church’s associations with the former colonial regime of Spain, its negative relationship with anti-colonial Philippine hero Jose Rizal and its attachment to what is legally defined as a sovereign state, The Holy See (The Vatican) – Duterte’s dealings with the Church require the same sort of strategy and skills that one would require when dealing with a traditional foreign power.” He explained. “Legally, Duterte has frequently warned Church leaders not to meddle in the sovereign affairs of the political state of the nation. Duterte seems keen to enforce the neglected provisions of The Philippine Constitution mandating a separation of institutional church from state.” He added. “Today, the Roman Catholic Church in The Philippines is akin to The Liberal Party at prayer and thus it represents the dangerous prospect of what should be an apolitical religious body openly associating itself with a vocal yet increasingly unpopular political opposition. Simultaneously, in seeking to wrap themselves in the Cross, Liberals and others opposed to Duterte’s reforms seek to paint themselves as somehow more Godly than Duterte and his supporters – something which is a prima facie threat to the democratic integrity of Philippine politics.” Garrie noted. 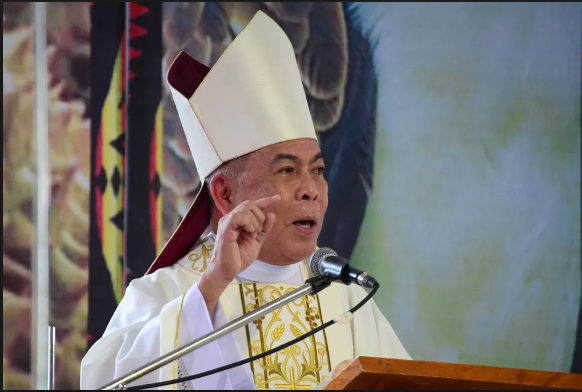 “In other words, the Church now realises that Duterte is wiling and able of using his platform as head of state to expose the corruption, hypocrisy and deficiencies of the institutional church, all the while guiding open minded Filipinos towards a path to God which does not necessarily rely on the teachings of the Roman Catholic Church.” Garrie explained. “Duterte therefore is giving his people and the wider world spiritual guidance that is shaped by an honest reflection of his personal experiences while also giving the Church’s de-facto political arm a warning: cease your meddling or there will be more powerful and influential anti-clerical rhetoric to come.” Garrie concluded.